Two titanium plaques etched with thousands of miniaturized drawings made by children have been fixed to the European Space Agency's Characterizing Exoplanet Satellite (CHEOPS). Europe's new exoplanet-studying spacecraft just got a lot prettier. Two plaques etched with children’s artwork have been attached to the European Space Agency's Characterizing Exoplanet Satellite (CHEOPS), ESA ;officials announced Monday (Aug. 27). 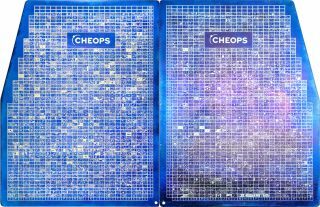 CHEOPS is a small-class mission, meaning it cannot cost ESA more than 50 million euros (about $58 million at current exchange rates). The spacecraft will measure the diameters of alien worlds whose masses are already known, allowing researchers to figure out the planets' densities (and, therefore, their rough composition). Each plaque is nearly 7 inches (18 centimeters) wide and about 9.4 inches (24 cm) tall. The satellite will do this via the "transit method," studying the exoplanets as they cross the faces of their host stars from the satellite's perspective. NASA's Kepler space telescope has used this strategy to great effect, discovering more than 2,650 confirmed alien worlds to date. And NASA's recently launched Transiting Exoplanet Survey Satellite (TESS) is employing the technique to look for alien worlds around stars relatively close to our sun. Technicians just wrapped up a series of tests on CHEOPS at the company RUAG Space in Zurich, and the spacecraft will soon be moved to ESA's technical center in the Netherlands for further trials, ESA officials said. Testing is on track to be finished by the end of the year, they added. Artist's illustration of CHEOPS in Earth orbit. The satellite is scheduled to launch in the first half of 2019. CHEOPS is scheduled to launch to Earth orbit from Europe’s Spaceport in Kourou, French Guiana, in the first half of 2019. "This unique satellite, the product of European collaboration, has already inspired the young generation, seen in the drawings engraved on the plaques unveiled today as CHEOPS begins its final stages of preparations before moving to the launch site," ESA Director General Jan Wörner said in a statement Monday.